As acoustical and vibration consultants, we are sometimes presented with what we call “non-physical criteria.” These are statements of sensitivity that don’t make any physical sense. Non-physical criteria are usually predicated on the misunderstanding that it is possible to eliminate these contaminants. For example, an instrument vendor might demand that you “install the microscope in a vibration-free environment” or “avoid any sound in the room.” These are unhelpful criteria that cannot be met on earth. Sometimes, they are used by new toolmakers who haven’t yet had the time to think of everything before selling novel and interesting tools. Other times, these kinds of statements are used colloquially. Our general practice is to assume the latter. 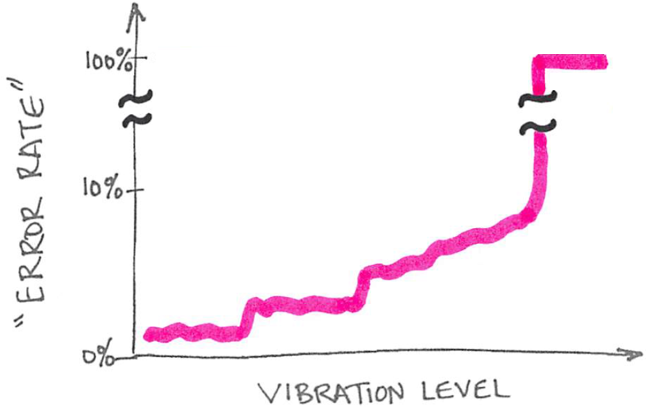 If a vendor says that an instrument needs a “vibration-free environment,” then we interpret this to mean that “floor vibrations should be below the threshold of human perception.” This isn’t unreasonable: lots of people believe that, if they can’t feel it, there must not be any significant building motion. Unless the vendor is selling electron microscopes, we will assume that they simply don’t understand that literally everything around them is constantly shaking. At some level, any physical object is sensitive to these environmental parameters. Since most situations are not particularly extreme, however, we don’t often think about it. You probably won’t retain a consultant the next time you buy a refrigerator, but make no mistake: there is some floor vibration level at which the compressor won’t work properly. On the other hand, it shouldn’t be surprising that there are some unusual sensitivities in critical environments like laboratories or semiconductor fabs. Most of the acoustical sensitivities lie in a regime that you can experience with your own ears. With the exception of very-low-frequency noise (infrasound), you can hear all of the same sounds that might affect tools like electron microscopes. In contrast, the vibration sensitivities of modern laboratory instruments are of a completely different order. The faintest tremors felt by humans are orders of magnitude too strong for many tools to operate properly. This means that you can actually hear most of the sounds that might interfere with that electron microscope, but you cannot possibly hope to feel the vibrations that would impact it. Realistic criteria acknowledge the relationship between performance and interfering parameters. In this hypothetical example, an error rate climbs with building vibration; such a dataset might be used to develop a defensible criterion. Note that for sensitive tools, the 100% error rate could conceivably occur at a level that is 100 times too small for humans to even notice. Contact us if you need help developing or working with environmental criteria in your laboratory building, whether for an off-the-shelf instrument or for a one-of-a-kind installation. We have consulting experience with toolmakers as well as research institutions, and we can help make your product or project more successful.